Queen Nefertiti - Queen Nefertiti Bust - How did Queen Nefertiti die. Queen Nefertiti was an Egyptian queen and an amazing wife of Akhnaten “the Egyptian Pharaoh”. She was born in 1370 B.C and died in 1330 B.C. Queen Nefertiti was known of worshiping only one god, Aten “the Sun disc”, and this caused somehow a religious revolution. Her reign is known as the wealthiest period of Ancient Egyptian history. She ruled with her husband during the middle of the 1300 B.C. After the death of her husband, she ruled briefly as Neferneferuaten until the accession of Tutankhamun. Her name means “a beautiful woman has come”. 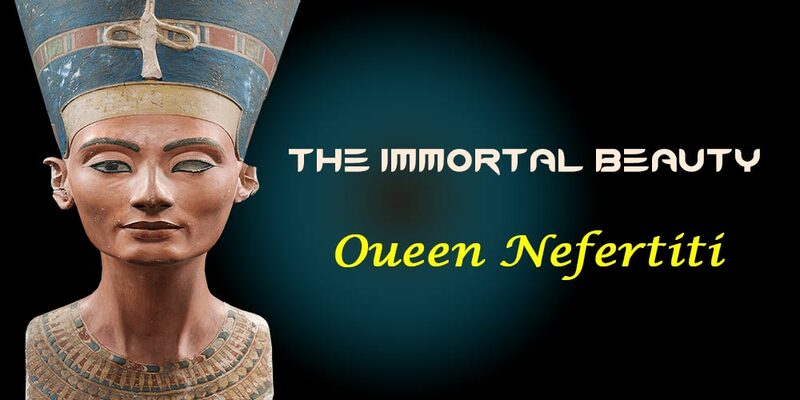 There are many titles of Queen Nefertiti like Hereditary Princess, Great of Praises, Lady of Grace, Sweet of Love, Lady of The Two Lands, Main King’s Wife, his beloved, Great King’s Wife. She was also called Akhnaten’s beloved, Lady of all Women, and Mistress of Upper and Lower Egypt. She was famous for her bust “the most iconic symbols of Egypt”, which is located now in the Neues Museum in Berlin. It was discovered by the team of the German archeologist Ludwig Borchardt. He agreed with the Egyptian government that he’ll take part in the bust so that the bust was shipped as part of the German portion. This bust exemplifies the understanding of the Ancient Egyptians to the realistic facial proportions. Queen Nefertiti was the daughter of the vizier of Amenhotep III called Ay, who raised her up in his palace at Thebes. She was probably an adherent of the cult of Aten. She married Amenhotep IV when she was only fifteen years old and after the death of Amenhotep III, she ruled Egypt with her husband. Queen Nefertiti got six daughters out of her marriage from Akhnaten and one of them called Ankhesenamun, who married her half-brother Tutankhamun, the future ruler of Egypt. Amenhotep IV changed his name to Akhenaten in the fifth year of being an Egyptian ruler. He closed all the temples and declared Aten to be the one true God as Queen Nefertiti had an effect on Amenhotep IV to abandon all of the Egyptian gods for the sake of a monotheism centered on Aten. That is why god Aten was considered a powerful god and even the god of creation and the universe. Queen Nefertiti and Akhenaten were deeply in love and faithful to each other. They lived with their daughters at the palace of Malkata in Thebes. This palace was built under the reign of Amenhotep III but renovated under Akhenaten and re-named Tehen Aten. Akhnaten banished her because of her abandon of Aten. Her husband stayed away from her, as she couldn’t get a son “a male heir” for him. For being sad over the death of her daughter, she committed suicide. She changed her name to Smenkhkare and ruled until the reign of Tutankhamun. None of these theories can be proved. The fact that Akhenaten didn’t have a son is false as he had Tutankhamun so it can’t be believed that he kept Queen Nefertiti away as she couldn’t get a son for him. – Queen Nefertiti was an Icon of beauty. – Queen Nefertiti is the second “Empress” of Ancient Egypt after Cleopatra according to the west. After the discovery of her famous 3,300-limestone bust in 1912, she got the statue of a celebrity. She is considered the most beautiful Icone of female beauty in the culture of today. Her name also proves this point, which means “a beautiful woman has come”. – She was a great Royal Wife. – Queen Nefertiti got married to Amenhotep IV when she was only about 15 years old. While living together, they reached the throne of Egypt and became a very important couple. Egypt lived in their reign a very prosperous period during the whole Egyptian history. During the reign of Queen Nefertiti, Egypt lived a religious revolution, as she wanted to make only worshiping for one god over polytheism. Most temples were closed and priests had to change their way in instructing the others. Queen Nefertiti was a very important queen of Egypt although she reigned only for 12 years. In the depictions on the walls and tombs built during Akhenaten’s rule, she appeared to be a supporting queen who helps and stands right next to her husband in the ceremonial acts. In other depictions, she makes offerings for God Aten, drives a chariot or hits the enemies. The changing names of the king and the queen Amenhotep IV changed his name to be Akhenaten and Queen Nefertiti changed hers to be Neferneferuaten-Nefertiti to honor their god, Aten. Queen Nefertiti had mesmerizing beauty that can’t be described by words. Her bust shows Queen Nefertiti in a colorful portray that one German archeologist said that it is a living Egyptian artwork and must be seen. Queen Nefertiti used to make her own makeup from Galena Plant. She also had gorgeous accessories with special shape and size. How did Queen Nefertiti die? After 12 years from the reign of Akhenaten, Queen Nefertiti disappeared from the records of the history. There are inaccurate theories about her disappearance as some believe that she died because of plague, some believe that she died of sorrow over the death of her young daughter. Others believe that she dressed like a man and called herself Smenkhkare to be able to rule but none of these facts can be proved and her disappearance is still a mystery till now. You can discover the history of Queen Nefertiti, in addition to, exploring the treasures of her husband Amenhotep IV through a trip to Egypt, so check our Egypt tour packages and choose your ideal tour. You can also customize a trip to Egypt to witness your favorite places in Egypt.